Embroidering on crocheted fabric creates additional dimension and expression. You can transfer almost any embroidery design onto crocheted fabric. Crewel (embroidery worked with yarn instead of thread) and cross-stitch work especially well on crocheting. Creating crewel work: Traditionally, crewel work requires fine wool yarn, but over the years, it’s just come to be a style of embroidery that’s worked with any type of yarn, rather than thread. The designs are varied and numerous, and any design that you can embroider with thread, you can work with yarn. Crewel works especially well on plackets, collars, and cuffs, or for creating a large picture on the front or back of a sweater, pillow, or handbag. Enjoying cross-stitch: If you enjoy cross-stitch, adding it to your crochet design is a perfect way to combine your efforts and show off your multi-talented self. 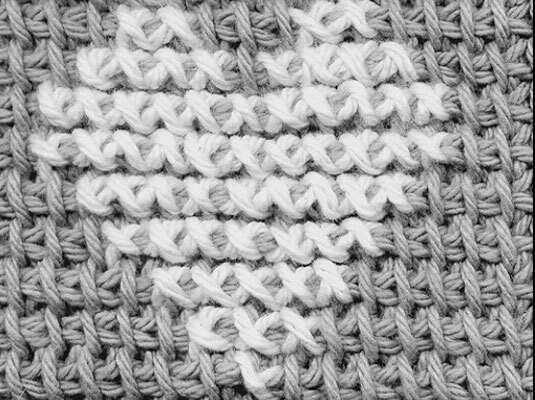 An Afghan (or Tunisian) stitch design just screams to be cross-stitched on. The small squares that are integral to the design make transferring pretty much any cross-stitch pattern to the right side a snap.